Buffalo Bill atop his favorite buffalo hunting horse, Brigham, taking aim at a buffalo with his 50-caliber needle gun “Lucretia”, was voted on of the 8 wonders of Kansas Art. We invite you to Oakley… Stop for the legend. Stay for the day. In 1868 William F. Cody, “Buffalo Bill”, made his living as a contract buffalo hunter feeding the crews laying track across Kansas for the Kansas Pacific Railroad. At the same time William Comstock, who was also sometimes called “Buffalo Bill” hunted buffalo to provide meat to feed the soldiers at Fort Wallace. 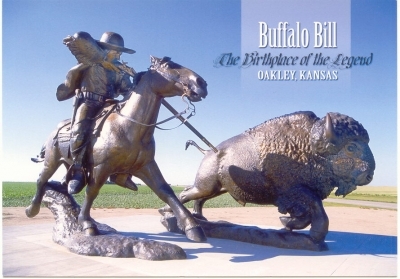 To determine who would be the real “Buffalo Bill” a wager was made and a contest was staged west of Oakley in Logan County, Kansas. The contest was to see which hunter could harvest the most buffalo in one day. William F. Cody won the contest 69 to 46. It was on that day in the spring of 1868 that the ‘legend of Buffalo Bill Cody’ was born. By the turn of the 20th Century, with his Wild West Show, “Buffalo Bill” Cody had become one of the most recognized and famous persons in the entire world. Cody helped shape the world’s image of the American West. Click the link below to see read the full story of “The Birthplace of the Legend” of Buffalo Bill. A pop-up window will open.